Sun worshiper Craig Colorusso has created a musical celebration to appear on Martha’s Vineyard at various locations throughout several weeks. As an innovative, well-traveled musician, he left the band scene to incorporate art into his life and began designing musical installations years ago. He was inspired by a trip to Rhyolite, Nev., where the desert is what pushed the production of something animated by our brightest star. With no energy wasted, Mr. Colorusso has created solar powered Sun Boxes. 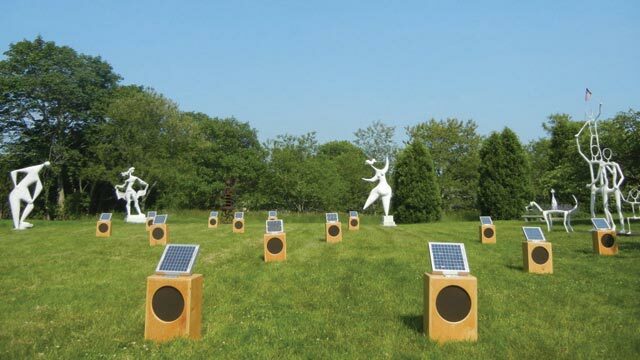 The exhibit is comprised of 20 “sun boxes.” Each one cradles a speaker, solar panel, and PC board strumming a continuously looped guitar note. Every box relies on itself to play its designated note, and because there are no connectors, the outcome is always different depending on the potency of the sun. Together, the various notes strumming in the heart of each box will eventually emulate a B flat chord. The pace and construction of the composition is governed only by the sun. Location on a specific day could play a part in the unique, meditative qualities the sun boxes emit, but it’s all about the heat with these carriages of sound. Saturday, Sept. 24, and Sunday, Sept. 25, Mr. Colorusso’s Sun Boxes will be at The FARM Institute (TFI) in Edgartown, beginning at 10 am, ending at 5 pm. During the day visitors can explore the farm, pick their own pumpkins, and experience the qualities of the solar-powered speakers, relaxing, slowing down, and walking on the farm. All proceeds from the pumpkin sales go to TFI’s education programs aiding in the attainment of sustainable agriculture. Pumpkins are priced at $0.90/lb. for 7 lbs. and under; $0.60 for over 7 lbs. On Monday, Sept. 26, you can discover the exhibit at Featherstone Center for The Arts in Oak Bluffs. 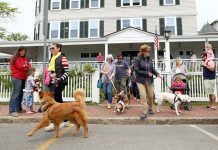 On Wednesday, they will be at Felix Neck Wildlife Sanctuary in Edgartown, and on September 29 at Morning Glory Farm, also in Edgartown. On Friday and Saturday, Sept. 30 and Oct. 1, see them at The Field Gallery in West Tisbury. The best way to understand the Sun Boxes is to pick a location, go, and listen. Go once, go many times to appreciate the earth, the Island, and what nature can allow us to do with her instruments. For more information, visit sun-boxes.com. 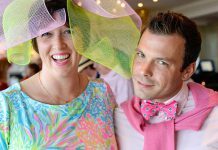 Carla Felter, a 2007 graduate of Franklin Pierce College, lives in Vineyard Haven and manages Pandora’s Box.